Order anime portraits from conventions for special on the day discounts, for more information contact the artist. 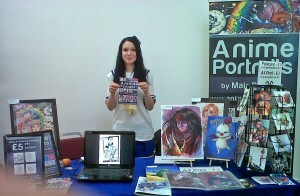 Look out for Anime Portraits by Mair Perkins at these upcoming events. Select your portrait, pay via the secure order form, then upload your photo at the end. Saturday 25th March 2012 at Phoenix Square in Leicester. Visit the Aniscape website for more information.